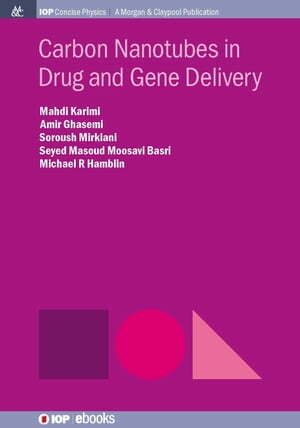 Collins Booksellers - Carbon Nanotubes in Drug and Gene Delivery by Amir Ghasemi, Soroush Mirkiani, Masoud Mousavi Basri & others, 9781681742625. Buy this book online. Recent important discoveries and developments in nanotechnology have had a remarkable and ever-increasing impact on many industries, especially materials science, pharmaceuticals, and biotechnology. Nanocarriers have been investigated for a wide variety of different medical applications. Some examples of these nanocarriers include polymersomes, liposomes, micelles and carbon-based nanomaterials. Within this book, the authors describe different features of carbon nanotubes (CNTs), survey the properties of both the multi-walled and single-walled varieties, and cover their applications in drug and gene delivery. In addition, the book explains the structure and properties of CNTs prepared by different method, and discussed their isolation and purification. The future of CNTs in the field of biomedical science will depend on minimizing their adverse effects by careful study of their structure and properties.